This stuff is made of EPS foam, glued in layers with wood glue, shaped with bread knives and sculpting tools, then lightly shrunk with a propane torch. Paint comes next. The 4th phase of the quay was painting and adding water fx. I also used Apoxie Sculpt to add some final stonework in the sewer and over the tunnel openings on the outside. The water fx is acrylic heavy gloss gel medium. It appears milky upon application, but later dries clear. I mixed a bit of green in to give it some mrukiness. Prior to adding it I painted a dark greenish blue on the water areas. There is a small corner in hell where they send you to cut tiny pieces of card to make the stonework for my quay project. Don't EVER get sent there. Phase 2 & 3 of the quay involved the addition of masonry to the surface and the sewer. Why did I choose to use card for the flagstones? Durability and speed. I had no desire to get in to casting in plaster, which is the other way I had wanted to do the street, and foam would have been too delicate. I make my stuff as pretty as possible while still being tough and gameable, as that's what it's for. The big scissors are tin snips, which I also use to make magnetic movement trays. Those two little buildings are a sneak peek at the modern zombie apocalypse stuff I am designing; it's acouple of warehouse pieces. More on that much later... for now, the docks. I've been eager to build docks for Bogenhafen for a long time. After some scavenging in my basement "Mordheim style" I was unable to uncover any Warpstone, but did discover a bunch of musty old lumber. A day of power saw usage converted the best of it in to several game table surfaces, and the Quay for the docks of Bogenhafen. This piece is in truth a prototype for my future design: a modern day 4x4' city table, with underground sewer and subway along the outside edge. More on that later. After a great deal of research I have begun to construct the first pier for the docks of Bogenhafen. The pier will be comprised of individual sections that can be moved around to create various configurations. This first pier is the prototype, and stands the same height as the quay pictured in the previous post. After several weeks of searching the web in vain for clear reference on the construction of wooden piers, I finally checked out some books on deck building and dock building, which proved invaluable. River Barnacles: Bogenhafen is situated on the river Bogen, miles away from the sea. So why the barnacles? Just an experiment with this prototype, I may or may not apply barnacles to all of the pier pieces. The city of Bogenhafen is one of the richest in The Empire. 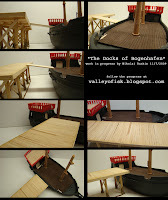 I thought it only fitting that the docks be the next thing on my personal project list. This one features removable street panels to reveal the basements, as well as a sewer running beneath the outside edge. Once the quay is finished, modular wharf pieces will be added. The first progress pic shows a wood frame measuring 4' by 16" by 8", on which the stonework and everything else was attached.